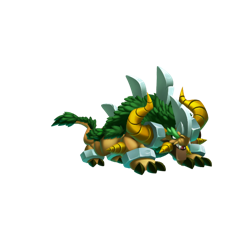 The Glint Dragon is a hefty beast, but he’s agile and fully protected. His pointed horns are weapons, even when he’s just moving his head. And the sharp shards of metal on his back will cut any opponent if they come close. Glint is not Currently Breedable. Sorry. These dragons can all critical hit against Glint, but won't be critical hit by Glint.